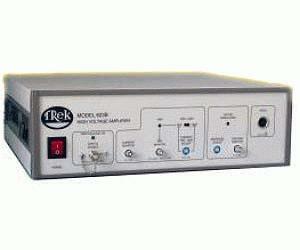 The Trek Model 609E-6 high-voltage DC-stable power amplifier is designed to provide precise control of bi-polar output voltages in the range of 0 to ±4 kV DC or peak AC with an output current capability of ±20 mA DC or peak AC. The Model 609E-6 can be configured as a noninverting amplifier with a fixed gain of 1000 V/V, or as an inverting or differential amplifier. Applications for the Model 609E-6 include AC and DC biasing of electrophotographic charging rollers, electrorheological fluid research, and dielectric material characterization. Features include an all-solid-state design, a slew rate greater than 150 V/µs, a large signal-bandwidth of greater than 6 kHz, and low noise operation. The four-quadrant active output stage sinks or sources current into reactive or resistive loads throughout the output voltage range. This technique is essential for achieving the accurate output responses and high slew rates demanded by reactive loads.